My first charity auction is up and running! I've been busy sewing bags and totes for my upcoming craft fair so I made a extra, a special one for the auction and you can find it here on eBay. 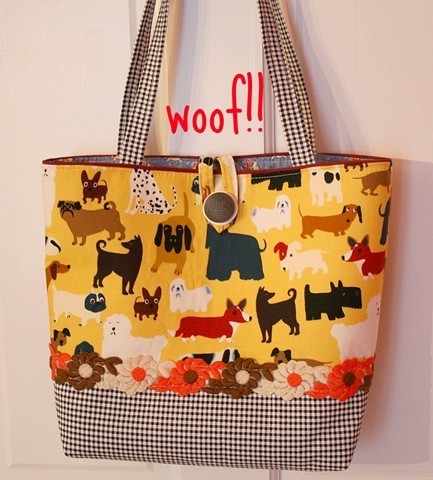 100% of the sale price of this bag will go to help all the furry souls over at A Place to Bark. Bernie Berlin is the tireless force behind this incredible place. If you haven't heard of Bernie or her shelter here is a little blurb from the website. "A PLACE TO BARK is a no kill foster and adoption rescue dedicated to the welfare of animals and was founded by Bernie Berlin. Established in 2001, we mainly work with Animal Control Agencies, rescuing animals from high kill shelters and fostering them until they are healthy. This provides an ideal situation for the animals. They are then placed for adoption through Humane Societies in various parts of the country. We cover all costs for the medical care of the animals with no cost to the Humane Societies. We also handle some private adoptions after a strict screening process." If you want to help out Bernie and the animals and get a fun tote bag too, check out my auction and tell all your friends! omgosh, that Toto (oops, tote!) is fabulous! We may things to donate to our local shelter too…every little bit helps, kudos to you! ps…..thanks for joining my lil swap! I’ve given you an award. Go to http://renaissancegardenblog.blogspot.com/2009/10/another-award.html to claim it. Darling tote. That fabric is wonderful and so much fun! Lovely! You are a fabulous sewer. I really admire your work. It’s darling, Suzy! And such a great cause. I’m currently in the lead! And for such a great cause. It sounds like a wonderful shelter. What an awesome tote and an awesome cause! I’ll spread the word. Gone before I got there!! Make more!